This article is about microprocessors. For Central processing unit, see CPU. A microprocessor is a computer processor that incorporates the functions of a central processing unit on a single integrated circuit (IC), or at most a few integrated circuits. The microprocessor is a multipurpose, clock driven, register based, digital-integrated circuit that accepts binary data as input, processes it according to instructions stored in its memory, and provides results as output. Microprocessors contain both combinational logic and sequential digital logic. Microprocessors operate on numbers and symbols represented in the binary numeral system. The integration of a whole CPU onto a single chip or on a few chips greatly reduced the cost of processing power, increasing efficiency. Integrated circuit processors are produced in large numbers by highly automated processes, resulting in a low per-unit cost. Single-chip processors increase reliability because there are many fewer electrical connections to fail. As microprocessor designs improve, the cost of manufacturing a chip (with smaller components built on a semiconductor chip the same size) generally stays the same. The internal arrangement of a microprocessor varies depending on the age of the design and the intended purposes of the microprocessor. The complexity of an integrated circuit (IC) is bounded by physical limitations on the number of transistors that can be put onto one chip, the number of package terminations that can connect the processor to other parts of the system, the number of interconnections it is possible to make on the chip, and the heat that the chip can dissipate. Advancing technology makes more complex and powerful chips feasible to manufacture. A minimal hypothetical microprocessor might include only an arithmetic logic unit (ALU) and a control logic section. The ALU performs operations such as addition, subtraction, and operations such as AND or OR. Each operation of the ALU sets one or more flags in a status register, which indicate the results of the last operation (zero value, negative number, overflow, or others). The control logic retrieves instruction codes from memory and initiates the sequence of operations required for the ALU to carry out the instruction. A single operation code might affect many individual data paths, registers, and other elements of the processor. The ability to put large numbers of transistors on one chip makes it feasible to integrate memory on the same die as the processor. This CPU cache has the advantage of faster access than off-chip memory and increases the processing speed of the system for many applications. Processor clock frequency has increased more rapidly than external memory speed, except in the recent past, so cache memory is necessary if the processor is not delayed by slower external memory. Graphics processing units (GPUs) are processors designed primarily for realtime rendering of 3D images. They may be fixed function (as was more common in the 1990s), or support programmable shaders. With the continuing rise of GPGPU, GPUs are evolving into increasingly general-purpose stream processors (running compute shaders), while retaining hardware assist for rasterizing, but still differ from CPUs in that they are optimized for throughput over latency, and are not suitable for running application or OS code. Other specialized units exist for video processing and machine vision. Microcontrollers integrate a microprocessor with peripheral devices in embedded systems. These tend to have different tradeoffs compared to CPUs. 32-bit processors have more digital logic than narrower processors, so 32-bit (and wider) processors produce more digital noise and have higher static consumption than narrower processors. Reducing digital noise improves ADC conversion results. So, 8- or 16-bit processors can be better than 32-bit processors for system on a chip and microcontrollers that require extremely low-power electronics, or are part of a mixed-signal integrated circuit with noise-sensitive on-chip analog electronics such as high-resolution analog to digital converters, or both. Nevertheless, trade-offs apply: running 32-bit arithmetic on an 8-bit chip could end up using more power, as the chip must execute software with multiple instructions. Modern microprocessors go into low power states when possible, and an 8-bit chip running 32-bit calculations would be active for more cycles. This creates a delicate balance between software, hardware and use patterns, and costs. When manufactured in a similar process, 8-bit microprocessors use less power when operating and less power when sleeping than 32-bit microprocessors. However, a 32-bit microprocessor may use less average power than an 8-bit microprocessor when the application requires certain operations such as floating-point math that take many more clock cycles on an 8-bit microprocessor than on a 32-bit microprocessor, so the 8-bit microprocessor spends more time in high-power operating mode. By the late 1960s, designers were striving to integrate the central processing unit (CPU) functions of a computer onto a handful of MOS LSI chips, called microprocessor unit (MPU) chipsets. Building on an earlier Busicom design from 1969, Intel introduced the first commercial microprocessor, the 4-bit Intel 4004, in 1971, followed by its 8-bit microprocessor 8008 in 1972. In 1969, Lee Boysel, b8-bit arithmetic logic units (3800/3804) he designed earlier at Fairchild, created the Four-Phase Systems Inc. AL-1, an 8-bit CPU slice that was expandable to 32-bits. In 1970, Steve Geller and Ray Holt of Garrett AiResearch designed the MP944 chipset to implement the F-14A Central Air Data Computer on six metal-gate chips fabricated by AMI. During the 1960s, computer processors were constructed out of small- and medium-scale ICs, each containing from tens of transistors to a few hundred. These were placed and soldered onto printed circuit boards, and often multiple boards were interconnected in a chassis. A large number of discrete logic gates uses more electrical power—-and therefore produces more heat—-than a more integrated design with fewer ICs. The distance that signals have to travel between ICs on the boards limits a computer's operating system speed. In the NASA Apollo space missions to the moon in the 1960s and 1970s, all onboard computations for primary guidance, navigation, and control were provided by a small custom processor called "The Apollo Guidance Computer". It used circuit boards whose only logic elements were three-input NOR gates. Three projects delivered a microprocessor at about the same time: Garrett AiResearch's Central Air Data Computer (CADC), Texas Instruments (TI) TMS 1000 (1971 September) and Intel's 4004 (1971 November, based on an earlier 1969 Busicom design). Arguably, Four-Phase Systems AL1 microprocessor was also delivered in 1969. The Smithsonian Institution says TI engineers Gary Boone and Michael Cochran succeeded in creating the first microcontroller (also called a microcomputer) and the first single-chip CPU in 1971. The result of their work was the TMS 1000, which went on the market in 1974. TI stressed the 4-bit TMS 1000 for use in pre-programmed embedded applications, introducing a version called the TMS1802NC on September 17, 1971 that implemented a calculator on a chip. TI filed for a patent on the microprocessor. Gary Boone was awarded U.S. Patent 3,757,306 for the single-chip microprocessor architecture on September 4, 1973. In 1971, and again in 1976, Intel and TI entered into broad patent cross-licensing agreements, with Intel paying royalties to TI for the microprocessor patent. A history of these events is contained in court documentation from a legal dispute between Cyrix and Intel, with TI as inventor and owner of the microprocessor patent. A computer-on-a-chip combines the microprocessor core (CPU), memory, and I/O (input/output) lines onto one chip. The computer-on-a-chip patent, called the "microcomputer patent" at the time, U.S. Patent 4,074,351, was awarded to Gary Boone and Michael J. Cochran of TI. Aside from this patent, the standard meaning of microcomputer is a computer using one or more microprocessors as its CPU(s), while the concept defined in the patent is more akin to a microcontroller. The Intel 4004 is generally regarded as the first commercially available microprocessor, and cost US$60 (equivalent to $362.56 in 2017). The first known advertisement for the 4004 is dated November 15, 1971 and appeared in Electronic News. The microprocessor was designed by a team consisting of Italian engineer Federico Faggin, American engineers Marcian Hoff and Stanley Mazor, and Japanese engineer Masatoshi Shima. The Intel 4004 was followed in 1972 by the Intel 8008, the world's first 8-bit microprocessor. The 8008 was not, however, an extension of the 4004 design, but instead the culmination of a separate design project at Intel, arising from a contract with Computer Terminals Corporation, of San Antonio TX, for a chip for a terminal they were designing, the Datapoint 2200—fundamental aspects of the design came not from Intel but from CTC. In 1968, CTC's Vic Poor and Harry Pyle developed the original design for the instruction set and operation of the processor. In 1969, CTC contracted two companies, Intel and Texas Instruments, to make a single-chip implementation, known as the CTC 1201. In late 1970 or early 1971, TI dropped out being unable to make a reliable part. In 1970, with Intel yet to deliver the part, CTC opted to use their own implementation in the Datapoint 2200, using traditional TTL logic instead (thus the first machine to run "8008 code" was not in fact a microprocessor at all and was delivered a year earlier). Intel's version of the 1201 microprocessor arrived in late 1971, but was too late, slow, and required a number of additional support chips. CTC had no interest in using it. CTC had originally contracted Intel for the chip, and would have owed them US$50,000 (equivalent to $302,136 in 2017) for their design work. To avoid paying for a chip they did not want (and could not use), CTC released Intel from their contract and allowed them free use of the design. Intel marketed it as the 8008 in April, 1972, as the world's first 8-bit microprocessor. It was the basis for the famous "Mark-8" computer kit advertised in the magazine Radio-Electronics in 1974. This processor had an 8-bit data bus and a 14-bit address bus. A low overall cost, small packaging, simple computer bus requirements, and sometimes the integration of extra circuitry (e.g. the Z80's built-in memory refresh circuitry) allowed the home computer "revolution" to accelerate sharply in the early 1980s. This delivered such inexpensive machines as the Sinclair ZX81, which sold for US$99 (equivalent to $266.49 in 2017). A variation of the 6502, the MOS Technology 6510 was used in the Commodore 64 and yet another variant, the 8502, powered the Commodore 128. Intel "upsized" their 8080 design into the 16-bit Intel 8086, the first member of the x86 family, which powers most modern PC type computers. Intel introduced the 8086 as a cost-effective way of porting software from the 8080 lines, and succeeded in winning much business on that premise. The 8088, a version of the 8086 that used an 8-bit external data bus, was the microprocessor in the first IBM PC. Intel then released the 80186 and 80188, the 80286 and, in 1985, the 32-bit 80386, cementing their PC market dominance with the processor family's backwards compatibility. The 80186 and 80188 were essentially versions of the 8086 and 8088, enhanced with some onboard peripherals and a few new instructions. Although Intel's 80186 and 80188 were not used in IBM PC type designs, second source versions from NEC, the V20 and V30 frequently were. The 8086 and successors had an innovative but limited method of memory segmentation, while the 80286 introduced a full-featured segmented memory management unit (MMU). The 80386 introduced a flat 32-bit memory model with paged memory management. The most significant of the 32-bit designs is the Motorola MC68000, introduced in 1979. The 68k, as it was widely known, had 32-bit registers in its programming model but used 16-bit internal data paths, three 16-bit Arithmetic Logic Units, and a 16-bit external data bus (to reduce pin count), and externally supported only 24-bit addresses (internally it worked with full 32 bit addresses). In PC-based IBM-compatible mainframes the MC68000 internal microcode was modified to emulate the 32-bit System/370 IBM mainframe. Motorola generally described it as a 16-bit processor. The combination of high performance, large (16 megabytes or 224 bytes) memory space and fairly low cost made it the most popular CPU design of its class. The Apple Lisa and Macintosh designs made use of the 68000, as did a host of other designs in the mid-1980s, including the Atari ST and Commodore Amiga. In 2001, IBM introduced the first commercial multi-core processor, the monolithic two-core POWER4. Personal computers did not receive multi-core processors until the 2005 introduction, of the two-core Intel Pentium D. The Pentium D, however, was not a monolithic multi-core processor. It was constructed from two dies, each containing a core, packaged on a multi-chip module. The first monolithic multi-core processor in the personal computer market was the AMD Athlon X2, which was introduced a few weeks after the Pentium D. As of 2012, dual- and quad-core processors are widely used in home PCs and laptops, while quad-, six-, eight-, ten-, twelve-, and sixteen-core processors are common in the professional and enterprise markets with workstations and servers. In 2002, less than 10% of all the CPUs sold in the world were 32-bit or more. Of all the 32-bit CPUs sold, about 2% are used in desktop or laptop personal computers. Most microprocessors are used in embedded control applications such as household appliances, automobiles, and computer peripherals. Taken as a whole, the average price for a microprocessor, microcontroller, or DSP is just over US$6 (equivalent to $8.16 in 2017). In 2003, about US$44 (equivalent to $58.53 in 2017) billion worth of microprocessors were manufactured and sold. Although about half of that money was spent on CPUs used in desktop or laptop personal computers, those count for only about 2% of all CPUs sold. The quality-adjusted price of laptop microprocessors improved −25% to −35% per year in 2004–2010, and the rate of improvement slowed to −15% to −25% per year in 2010–2013. ↑ Saether, Kristian; Fredriksen, Ingar. "Atmel Corporation Introducing a New Breed of Microcontrollers for 8/16-bit Applications" (PDF). Archived (PDF) from the original on 2015-09-23. ↑ "AN1636: Understanding and minimising ADC conversion errors" Archived 2015-08-07 at the Wayback Machine.. 2003. ↑ Rahul Singh et al. "Method and apparatus for reducing switching noise in a system-on-chip (SoC) integrated circuit including an analog-to-digital converter (ADC)" Archived 2015-06-23 at the Wayback Machine.. 2009. ↑ "Managing the Impact of Increasing Microprocessor Power Consumption" (PDF). Rice University. Archived (PDF) from the original on October 3, 2015. Retrieved October 1, 2015. 1 2 CMicrotek. "8-bit vs 32-bit Micros" Archived 2014-07-14 at the Wayback Machine.. 2013. ↑ Richard York. "8-bit versus 32-bit MCUs - The impassioned debate goes on" Archived 2014-07-14 at the Wayback Machine..
↑ "32-bit Microcontroller Technology: Reduced processing time" Archived 2014-07-14 at the Wayback Machine..
↑ "Cortex-M3 Processor: Energy efficiency advantage" Archived 2014-02-24 at the Wayback Machine..
↑ Viatron Computer Systems. "System 21 is Now!" Archived 2011-03-21 at the Wayback Machine. (PDF). ↑ Moore, Gordon (19 April 1965). "Cramming more components onto integrated circuits" (PDF). Electronics. 38 (8). Archived from the original (PDF) on 18 February 2008. Retrieved 2009-12-23. ↑ "Excerpts from A Conversation with Gordon Moore: Moore's Law" (PDF). Intel. 2005. Archived from the original (PDF) on 2012-10-29. Retrieved 2009-12-23. ↑ Holt, Ray M. "World's First Microprocessor Chip Set". Ray M. Holt website. Archived from the original on January 6, 2014. Retrieved 2010-07-25. ↑ Holt, Ray (27 September 2001). Lecture: Microprocessor Design and Development for the US Navy F14 FighterJet (Speech). Room 8220, Wean Hall, Carnegie Mellon University, Pittsburgh, PA, US. Archived from the original on 1 October 2011. Retrieved 2010-07-25. ↑ Parab, Jivan S.; Shelake, Vinod G.; Kamat, Rajanish K.; Naik, Gourish M. (2007). Exploring C for Microcontrollers: A Hands on Approach (PDF). Springer. p. 4. ISBN 978-1-4020-6067-0. Archived (PDF) from the original on 2011-07-20. Retrieved 2010-07-25. ↑ Dyer, S. A.; Harms, B. K. (1993). "Digital Signal Processing". In Yovits, M. C. Advances in Computers. 37. Academic Press. pp. 104–107. doi:10.1016/S0065-2458(08)60403-9. ISBN 9780120121373. Archived from the original on 2016-12-29. ↑ Basset, Ross (2003). "When is a Microprocessor not a Microprocessor? The Industrial Construction of Semiconductor Innovation". In Finn, Bernard. Exposing Electronics. Michigan State University Press. p. 121. ISBN 0-87013-658-5. Archived from the original on 2014-03-30. ↑ "1971 - Microprocessor Integrates CPU Function onto a Single Chip". The Silicon Engine. Computer History Museum. Archived from the original on 2010-06-08. Retrieved 2010-07-25. ↑ Shaller, Robert R. (15 April 2004). "Technological Innovation in the Semiconductor Industry: A Case Study of the International Technology Roadmap for Semiconductors" (PDF). George Mason University. Archived (PDF) from the original on 2006-12-19. Retrieved 2010-07-25. ↑ RW (3 March 1995). "Interview with Gordon E. Moore". LAIR History of Science and Technology Collections. Los Altos Hills, California: Stanford University. Archived from the original on 11 March 2012. ↑ Bassett 2003. pp. 115, 122. ↑ McGonigal, James (20 September 2006). "Microprocessor History: Foundations in Glenrothes, Scotland". McGonigal personal website. Archived from the original on 20 July 2011. Retrieved 2009-12-23. ↑ Tout, Nigel. "ANITA at its Zenith". Bell Punch Company and the ANITA calculators. Archived from the original on 2010-08-11. Retrieved 2010-07-25. ↑ "The Gilbert Hyatt Patent". intel4004.com. Federico Faggin. Archived from the original on 2009-12-26. Retrieved 2009-12-23. ↑ Crouch, Dennis (1 July 2007). "Written Description: CAFC Finds Prima Facie Rejection (Hyatt v. Dudas (Fed. Cir. 2007))". Patently-O blog. Archived from the original on 4 December 2009. Retrieved 2009-12-23. ↑ Augarten, Stan (1983). The Most Widely Used Computer on a Chip: The TMS 1000. State of the Art: A Photographic History of the Integrated Circuit. New Haven and New York: Ticknor & Fields. ISBN 0-89919-195-9. Archived from the original on 2010-02-17. Retrieved 2009-12-23. ↑ Mack, Pamela E. (30 November 2005). "The Microcomputer Revolution". Archived from the original on 14 January 2010. Retrieved 2009-12-23. ↑ "History in the Computing Curriculum" (PDF). Archived from the original (PDF) on 2011-07-19. Retrieved 2009-12-23. ↑ Bright, Peter (November 15, 2011). "The 40th birthday of—maybe—the first microprocessor, the Intel 4004". arstechnica.com. Archived from the original on January 6, 2017. ↑ Faggin, Federico; Hoff, Marcian E., Jr.; Mazor, Stanley; Shima, Masatoshi (December 1996). "The History of the 4004". IEEE Micro. 16 (6): 10–20. doi:10.1109/40.546561. Archived from the original on 2013-02-16. ↑ Faggin, F.; Klein, T.; Vadasz, L. (23 October 1968). Insulated Gate Field Effect Transistor Integrated Circuits with Silicon Gates (JPEG image). International Electronic Devices Meeting. 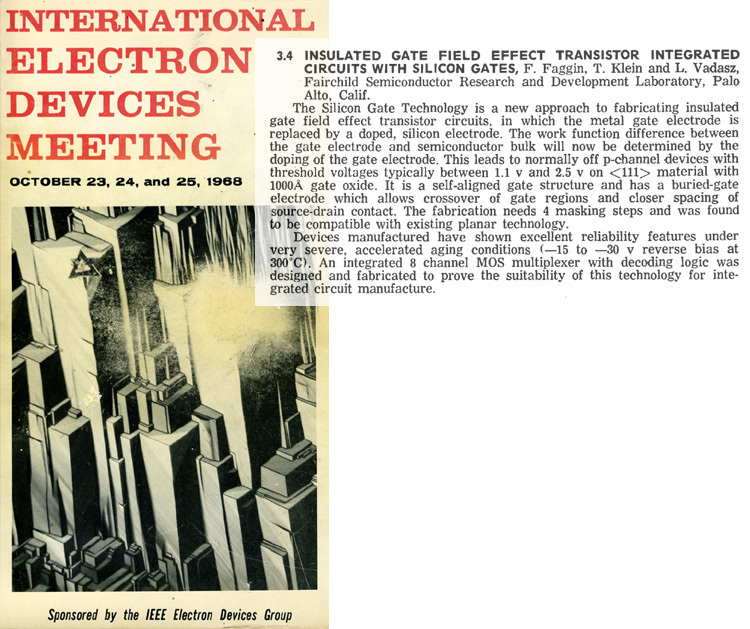 IEEE Electron Devices Group. Archived from the original on 19 February 2010. Retrieved 2009-12-23. ↑ Ceruzzi, Paul E. (May 2003). A History of Modern Computing (2nd ed.). MIT Press. pp. 220–221. ISBN 0-262-53203-4. 1 2 3 Wood, Lamont (August 2008). "Forgotten history: the true origins of the PC". Computerworld. Archived from the original on 2011-01-07. Retrieved 2011-01-07. ↑ Intel 8008 data sheet. ↑ The 80187 only has a 16-bit data bus because it used the 80387SX core. ↑ "Essentially, the 80C187 can be treated as an additional resource or an extension to the CPU. The 80C186 CPU together with an 80C187 can be used as a single unified system." Intel 80C187 datasheet, p. 3, November 1992 (Order Number: 270640-004). ↑ "Priorartdatabase.com". Priorartdatabase.com. 1986-01-01. Retrieved 2014-06-09. ↑ "Shoji, M. Bibliography". Bell Laboratories. 7 October 1998. Archived from the original on 16 October 2008. Retrieved 2009-12-23. ↑ "Timeline: 1982–1984". Physical Sciences & Communications at Bell Labs. Bell Labs, Alcatel-Lucent. 17 January 2001. Archived from the original on 2011-05-14. Retrieved 2009-12-23. ↑ Turley, Jim (July 1998). "MCore: Does Motorola Need Another Processor Family?". Embedded Systems Design. TechInsights (United Business Media). Archived from the original on 1998-07-02. Retrieved 2009-12-23. ↑ Garnsey, Elizabeth; Lorenzoni, Gianni; Ferriani, Simone (March 2008). "Speciation through entrepreneurial spin-off: The Acorn-ARM story" (PDF). Research Policy. 37 (2). doi:10.1016/j.respol.2007.11.006. Retrieved 2011-06-02. [...] the first silicon was run on April 26th 1985. ↑ Cantrell, Tom (1998). "Microchip on the March". Archived from the original on 2007-02-20. 1 2 Turley, Jim (18 December 2002). "The Two Percent Solution". Embedded Systems Design. TechInsights (United Business Media). Archived from the original on 3 April 2015. Retrieved 2009-12-23. ↑ WSTS Board Of Directors. "WSTS Semiconductor Market Forecast World Release Date: 1 June 2004 - 6:00 UTC". Miyazaki, Japan, Spring Forecast Meeting 18–21 May 2004 (Press release). World Semiconductor Trade Statistics. Archived from the original on 2004-12-07. ↑ Sun, Liyang (2014-04-25). "What We Are Paying for: A Quality Adjusted Price Index for Laptop Microprocessors". Wellesley College. Archived from the original on 2014-11-11. Retrieved 2014-11-07. … compared with -25% to -35% per year over 2004-2010, the annual decline plateaus around -15% to -25% over 2010-2013. ↑ Barr, Michael (1 August 2009). "Real men program in C". Embedded Systems Design. TechInsights (United Business Media). p. 2. Archived from the original on 22 October 2012. Retrieved 2009-12-23.